View of well-preserved pterosaur trackway on sandstone slab. 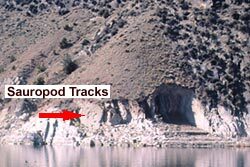 In the spring and summer of 2002, while conducting a field survey of paleontological resources, Utah Geological Survey paleontologists discovered a significant dinosaur tracksite at Flaming Gorge National Recreation Area. The field crew was returning to the marina after a day of surveying when Jim Kirkland, the State Paleontologist, spotted large sauropod tracks on the face of a sandstone cliff. Upon further investigation various other tracks were found including smaller pterosaur trackways and numerous casts of sauropod footprints. Sauropods were the long-necked, long-tailed dinosaurs living during the Jurassic Period, 180 million years ago. 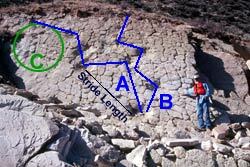 Sauropod tracks are easily identified by their large size. 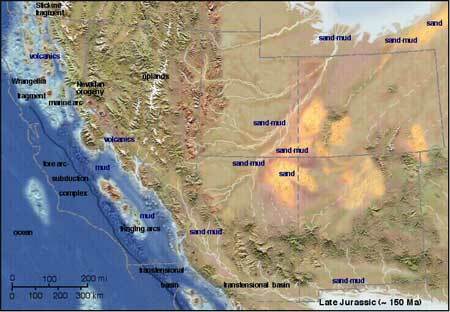 The sauropod tracks are in sandstone and mudstone layers of the Stump Formation deposited in early Late Jurassic approximately 155 million years ago. During this time Utah was a hot swampy lowland, as the inner seaway that once covered a large area of Utah withdrew to the north into Wyoming and Montana. Meandering streams and lakes abounded. The sauropod trackway and the trampled area found on the initial discovery surface are preserved as oval depressions with little detail of foot morphology (anatomy). 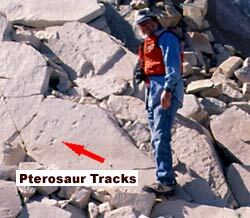 These tracks are interpreted as undertracks formed by a sauropod stepping onto the overlying surface. The majority of the tracks represent a larger adult, but a small area displays a trampled surface of several juvenile-sized imprints. 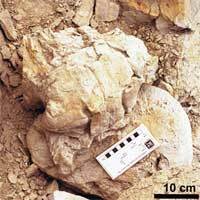 Well-preserved natural casts of sauropod tracks are also found in a rock layer above the original trackway. Many of these sauropod casts have digit and claw impressions produced by different-sized individuals and some also include skin impressions, which are extremely rare. The new discovery also includes several pterosaurian trackways below the sauropod tracks. The pterosaur, described as a large “flying reptile” that fed on shallow-sea flying fish, would have been well adapted to the coastal environment of the early Late Jurassic in eastern Utah. 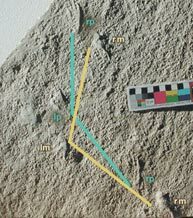 Two of the trackways contain complete sets of manus (front) and pes (back) imprints, both as negative (molds) and their positive (cast) counterpart. This assemblage of Late Jurassic tracks is one of a growing number of track localities recently discovered in the same geologic time interval from Arizona, central and eastern Utah, southern Wyoming, and Colorado. Because of the details preserved in the sauropod and pterosaur tracks at the Flaming Gorge site, they are a very important resource to future researchers studying dinosaur behavior. Efforts to preserve and protect the Flaming Gorge Reservoir tracksite from shoreline erosion and other environmental impacts continue. Several of the tracks have been removed and are now on display at the Utah Field House of Natural History State Park Museum in Vernal, Utah.